A common misconception is that nanomaterials are materials that have simply being miniaturised. The reality is that a single particle of a nanomaterial, has an average size between 1 to 100 nanometres (nm), which is extremely small. Nano means 10-9 or 0.000000001. 1 nano is regarded as equal to the distance across three atoms. These are synthesised materials (a manufactured combination of materials) with a nano-grain size of less than 100nm. They possess enhanced properties, such as increased tensile strength, thermal qualities and amplified magnetic and electrical attributes. Nano-crystalline materials can be used as coatings, foil, manufactured in sheet form, glass droplets, wire and other complex shapes. A practical application is in ultra-efficient solar panels, converting sunlight into electricity. Solar panels manufactured from nano-crystalline materials, are many times more productive than standard solar panels and have the potential to work effectively even on dull days. This could mean that we become much less reliant on the use of fossil fuels, in the production of electricity. Carbon Nanotubes, can be described as a layer or number of layers of graphite (graphene), formed as a tubular lattice structure. These tubes are much stronger than their steel equivalent, with the added property of flexibility and they are extremely lightweight. CNTs already have a number of practical applications, including electronics (FET transistors), rechargeable batteries (due to physical properties of graphene), bullet proof jackets, boat hull manufacture and vehicle parts. Nanomaterials are being developed, that combine the properties of more than one ‘parent material’. Nanocomposites can be three dimensional, arranged as a structure. They can also be two dimensional, being in the form of special clays and coatings. Further to this, they can be one dimensional, which means that they are in the form of a chain. Nanocomposite structures are being developed for medical applications. Nanotube structures hold cancer fighting cells, allowing them to grow and multiply, fighting cancerous cells. Nano coatings (nanodiamond) have been developed to remove the top layer of paint from car bodywork. Coatings have also been developed to be scratch resistant, protecting spray painted car bodywork. One dimensional polyaniline nanowire (a conducting polymer / plastic), is being used to conduct electrical current. These wires experience little ‘current’ loss, unlike fine copper wire. They are used to build very sensitive electrical sensors. 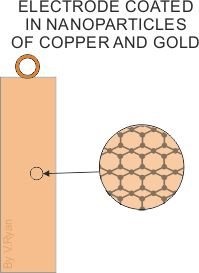 Copper is a metal that can be used to convert carbon dioxide into a hydrocarbon fuel. When copper is ‘excited’ with a small voltage, in a container filled with carbon dioxide and other ‘agents’, it is converted into methane, which can be used to produce electricity or to fuel cars. Electrodes coated with nanoparticles of copper and gold, reduce the amount of electrical energy required to convert the carbon dioxide to methane and it is a more efficient process. One day, this may provide a cost effective way of recycling environmentally damaging carbon dioxide from power stations, back into a fuel. Alloyed quantum dots are possibly the most interesting. 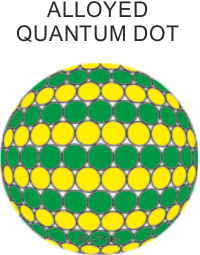 Each quantum dot is composed of different semiconductor crystals. Altering the proportions of each semiconductor, changes the colour of the light emitted. They have the potential to be used in the medical world, due to their ‘nano’ size. Research is being carried out in to developing sensors, that can be used inside the body, changing colour when they detect a particular medical condition.